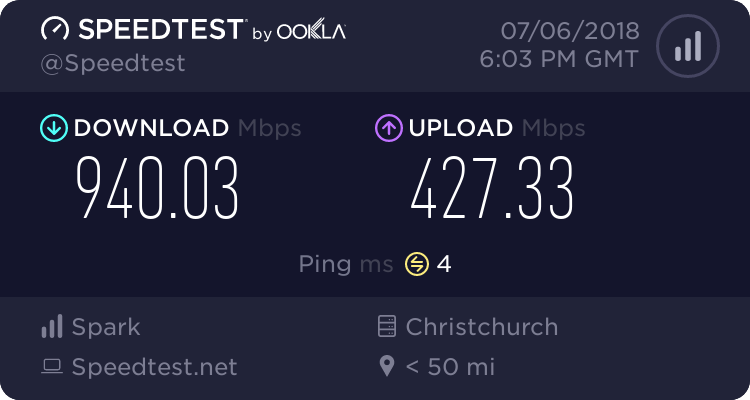 Which ISP for me in Auckland (10Mbps+ 40GB+ 6 months contract naked) I am a techie! Forums › New Zealand Broadband › Which ISP for me in Auckland (10Mbps+ 40GB+ 6 months contract naked) I am a techie! -Ideally 6 month contract - I guess a 12 month with a reasonable cancellation fee considered. -I am tech savvy as an electronic engineer so have no problem configuring a router, so bad support isn't an issue if it's reliable. -Don't know if they exist but a package where you get unlimited GB over night or such would be fine as the large downloads can be done then! If that's the case a 30GB limit would probably be fine! -Flexibility in limit i.e cheap extra GB would be a bonus as I'm not sure how much my partner will download! First up if you want speed, this will be 100% dependant on where you live. Chuck what ever address you are looking at staying in to here and make sure you are in a 20Mbps+ zone or UFB zone. Sods law we are about 500m literally outside of the UFB Zone. The rental house has a phone socket but I don't know what condition. Are there line rental fees on top of ISP quoted costs? I couldn't see mention of them on the 'flip' website - looks like just $65 a month? snap sounds like what you mite want they have the unlimited option over night (only with a data addon) and you can get a naked option. Thanks - will check out snap now! I think Flip also does overnight which is good news! Anyone shed any light on if there are hidden install fees? I basically answered 'yes' to I have a phone line, but does that mean physically installed to the house or have I paid line rental yet? I assume here in NZ line rental is also paid through the ISP? Also as for being 'stung' for picking these non contract, can anyone suggest the best option if we take the risk and sign a 12 month? We *may* end up staying at this address! Just checked Snap out - all was good great baseline 50GB package etc, love the youtube addon for $5! Couldn't see an option to use your own! I can't get VDSL or UFB btw. So anyone got any other suggestions. -Snap - not paying $345 router unless thats the score! -Flip - looking best so far, but don't know the catch with router and line rental? Buying the router is not compulsry with Snap, you can bring your own. Flip is bring your own modem/router. If 6 you want 6 months, then flip is prob the best, as most other isps have 12 month minimum terms. Just need to make sure that you are in their coverage area, and also be aware that they use carrier grade nat ( you won't get a public ip). Edit: I see that snap have a $99 install, no term option. I am with snap, bought my own router, and am happy with their service. I didn't realise you don't have to choose one of the boxes for modem choice - that's good news. So... no public IP I assume means no hosting game servers etc? They don't block a bunch of ports also do they? Can't think of any other potential issues with that? Also is that just Flip or snap also? Lastly can anyone shed light on the line rental for me - is there any situation where a new tennant doesn't pay new line install fees (in the UK we used to have pre-arranged switchovers then it doesnt cost). Still with naked broadband, are there no line rental fees, just can't see the related information - must be included in the price? Any specific naked DSL plans are all inclusive of the line charge component. Thanks for all the help so far. Great to know any line rental costs are included! Any way to avoid hefty 'line install' charges? muncedog: Just checked Snap out - all was good great baseline 50GB package etc, love the youtube addon for $5! However just saw the $99 install and $345 for a router! cheeky sods, they must get those in for $20 a pop I swear Couldn't see an option to use your own! Also worryingly didn't see flip mention a router charge..... I can't get VDSL or UFB btw. So anyone got any other suggestions. -Bigpipe registered interest -Snap - not paying $345 router unless thats the score! -Flip - looking best so far, but don't know the catch with router and line rental? Snap supply a pretty high end FritzBox for that price. You can choose your own modem/router and use it on Snap (and most other ISP's), config etc would be up to you with minimal support from helpdesk since they wouldn't be familiar with the make/model. For Snap: If you go 12 month contract and there is an existing phone line connected to the premises I don't think there is a setup or wiring charge (step 5 on their signup is optional). However lots of homes in NZ have shoddy wiring from back in the day with multiple jacks daisy chained, a master filter install is highly recommended if there isn't one already. If you're tech savvy you could just buy the filter some cat5/6 and DIY this. I gave both snap and flip a call seems that snap charges slightly more on the install but reviews points to snap being better, or at least on the limited info I could find anyway! Also hard to find but Im sure I saw somewhere that snap offers free usage between 1-7am? Also they would work out less if we ended up using over the 30Gb flip allouance as only $10 more for snap with 50GB! Any last pointers on this? I just hope we get a good enough speed with a splitter that I buy! Not sure why snap charge $99 install though - hooking up their end I guess! Might call them and state that its currently free with flip... see if I get anywhere!